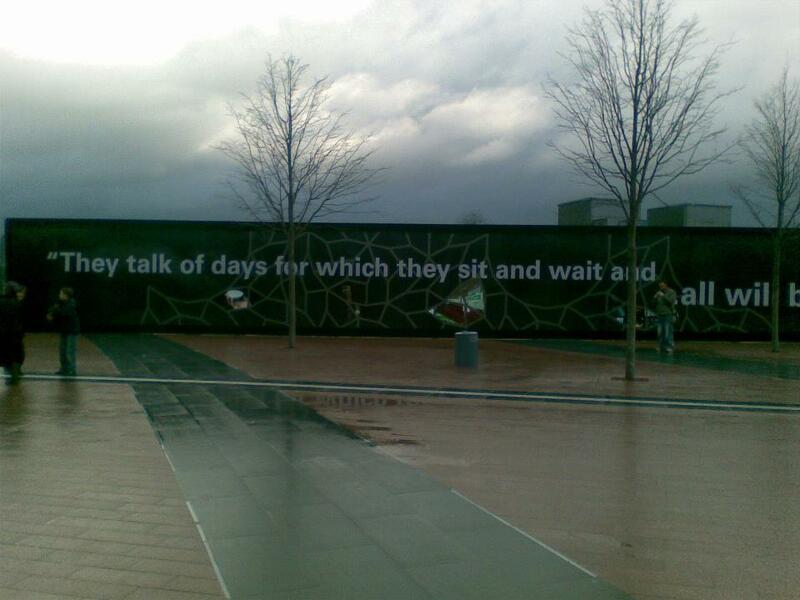 Above – the 02 Arena forecourt with words from Kashmir -totally surreal – photo via Dave Linwood. I had an excellent view stage left to the side – it was great to see Kevyn Gammond, Bob Harris and Justin Adams all in attendance in my block. The performance: full of the integrity, humility, emotion and power that characterised the glory days. Thank you Jimmy,Robert, JPJ and Jason for an amazing night. Right I’m off to be bed…it’s back to reality and retail frenzy in the morning. One thing is for certain – their performance at the O2 Arena on December 10 2007 has created rock history. No other band could have staged such an event as this phenomenal tribute to dear Ahmet. Dave Lewis – December 11th 2007. 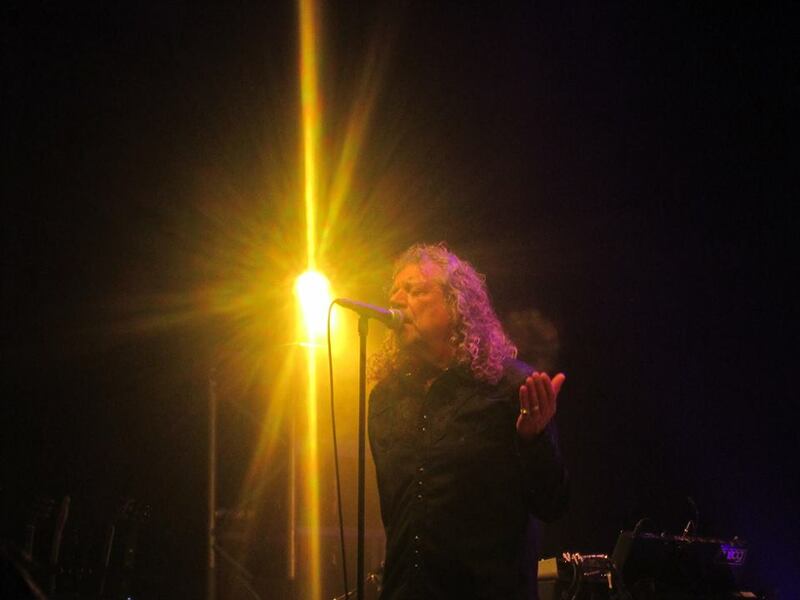 Tonight’s Robert Plant and The Sensational Space Shifters gig will be the 58th occasion I have seen Robert Plant sing into that Shure microphone at a London gig- through Zep and all the solo years and guest appearances – and the 120th occasion overall. So the list below represents the 119 occasions I’ve seen Robert Plant sing live –commencing with the 14 initial Led Zeppelin gigs I was lucky enough to attend and the 15th at the 02 in 2007 , through the Page & Plant collaboration, solo tours, one offs and TV recordings. 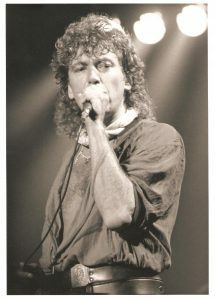 119 is not a band tally, though I have to say as we were looking at his various tour itineraries, Gary Foy and I kept asking ourselves why we didn’t do a whole lot more. 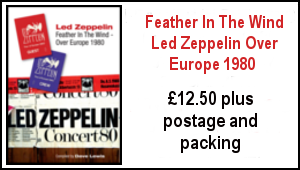 There looked to be many occasions we should have made the effort to get to say a Wolverhampton or Nottingham, Coventry or Birmingham – locations within relative ease, or festival dates such as Cropredy, Womad and Canterbury that slipped through. However, over the years the plain reality of life, circumstances, family, work commitments and finances frequently got in the way. 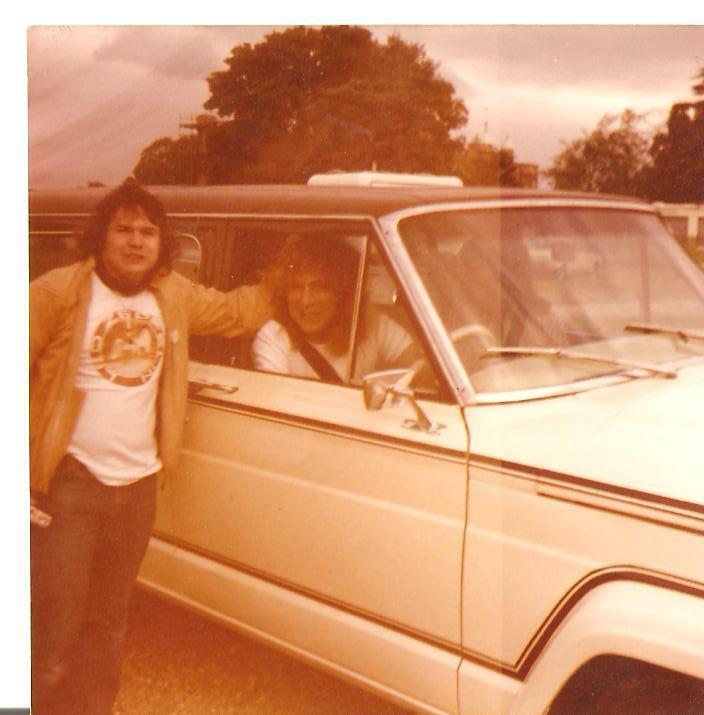 Back in the day, with little responsibilities, zipping around the country when I was younger was no trouble – but as you get older you can’t do everything and compromises have to be made. Mind you quite how I got away with eight nights out in July 1995 when the good lady Janet was eight months pregnant I’ll never know. In retrospect there have been some moments of mild recklessness juggling work,family etc in this quest to see the singer sing his songs. 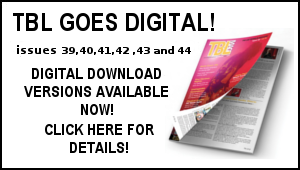 It’s a testament to Robert Plant’s unquenchable thirst for musical re invention that his latest album Carry Fire with The Sensational Space Shifters finds him on yet another fresh wave of critical and public acceptance. The prestigious BBC 6 Music showcase, various TV and radio interview slots plus a rapturously welcomed UK tour has helped propel his profile sky high in the last few weeks. 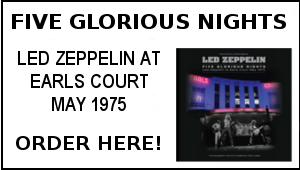 Not for his achievements in the eleven years of life in Led Zeppelin (astonishing as they were), not for the six times Grammy award winning collaboration with Alison Krauss (as wondrously surprising as that was), not for a one off reunion with his old band mates at the O2 (as magical as that was). Nor for his being selected to be a Commander of the British Empire, his dedication to Wolverhampton Wanderers, or his nurturing of and support of local talent and matters close to his heart in his Midlands bolt hole. 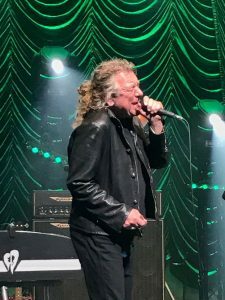 Impressive as all these accomplishments are – it will be above everything for his role as Robert Plant Vocalist and musician that will demand attention and appreciation in the coming months. 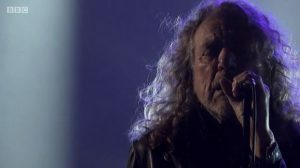 For me personally, from 1971 to 2017 these 1119 performances in the company of Robert Plant form a timeline of my life. I was 15 years and 77 days old when I first heard him scream out the ‘’Bali-hi’’ war cry of immigrant Song at the Empire pool Wembley on Sunday November 21st 1971. When I settle down in my seat tonight at the Royal Albert Hall for performance 120 I’ll be 61 and 95 days old. Nigh on 120 nights – it’s been to use the old cliché, quite a journey. 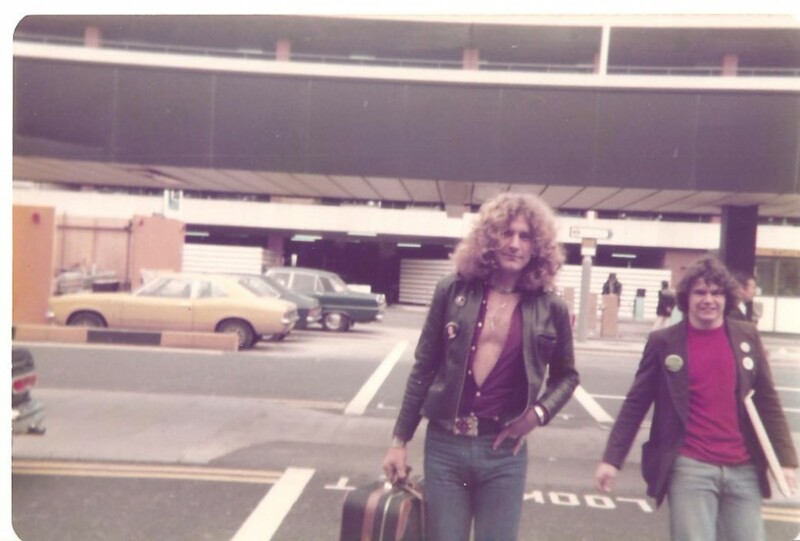 From the glory days of Led Zeppelin, through small club gigs with the Honeydrippers, his initial tentative solo tours, the mid 90s Unledded collaboration with Jimmy Page, back to the cubs with the Priory Of Brion, esoteric nights with Strange Sensation, the remarkable one off Zeppelin reunion at the 02, Grammy award winning bluegrass musings with Alsion Kruass to the eclecticism of his latest success in The Band Of Joy. I’ve been lucky to have witnessed some incredible nights. 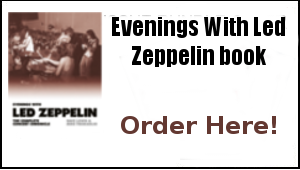 Led Zeppelin on a perishing cold Sunday night in November ‘71… in front of the golden god sitting on a limousine backstage at Earls Court May 25 1975… side of the stage in Frankfurt and Mannheim over Europe ’80… in the back of a rented hertz van in Sheffield with the Honeydrippers…in the presence of HRH Prince Charles Chares at the Dominion in ‘82… with the good lady Janet at the Tube in ‘83… the sheer excitement of the first Zep numbers sung live in Leicester University ’88.. Jimmy back next to him at the Hammersmith in ‘83 and ’88… the night at the Marquee in ‘88 when an unassuming chap approached me and said the immortal words ‘’Are you Dave Lewis?’’ (Yes Gary Foy that was me and we’ve shared some sketches since! )… toasting Sam’s arrival in a pub near the Hammersmith Odeon hours after her birth… Wearing And Tearing with Jimmy at Knebworth ‘90… sitting on Robert’s monitor at the Kings Head pub the smallest stage I’ve seen him on…Dazed and Confused sung as a suprise in Birmigham ’93… weaving the Unledded Zep magic with Jimmy in August 1994… Thank You –opening number before my very eyes second night second row in Meadowlands Arena New Jersey… up against the barriers in St Austell… escapades in Istnanbul followed by Shepherds Bush,Top Of The Pops and TFI Friday – three consecutive days in the company of P & P in the mad month of March of 98…. 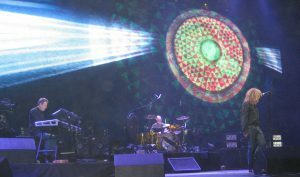 Night Flight and Trampled Underfoot at the ULU… No Regrets with the Priory at the Boardwalk Sheffield on the anniversary of night of Bonzo’s passing…. in a tent on a Halloween afternoon in Ashby De La Zouch (hi Kevin!)…. in a back street pub bar in Kings Heath on a Saturday night… Priory in Milton Keynes round the corner from my mate Phil’s house….that bizarre night of separate Plant & Page appearances at the Royal Albert Hall 2002….. World Cup fever before and after the Storytellers TV recording….TBL comes alive in the front rows of Hammersmith in 2002 when I had priority tickets and Frank Skinner telling me caustically ‘’shame he’s lost it’’ afterwards… Dermot O’ Leary interviewing Robert at the Recovered TV show before he and SS did a killer version of Love’s Seven And Seven Is….Tin Pan Valley at The Scala Radio Two recording…. Christmas cheer (too much so!) in Wolverhampton 2005…. warm vibes in Cornbury and Somerset House in the summer of ‘06…. back with The Honeydrippers for Roy Williams 60th at JB’s on Valentines Day 2007…… into the glow of the infinite glory that was theirs at the 02 six months later – watching his family members dancing to Rock And Roll in front of me….Black Country Woman with Alison at Wembley… reviving the marvellous Scott Walker’s Farmer In The City and those lines ‘’Who are you twenty one, twenty one, I’ll give you twenty one, twenty one’’ sending shivers down the spine at Abbey Road… revelling in a true Band Of Joy at Mayfair One and doing a little angel dance of delight at the London Forum, a life affirming gig at the Birmingham Symphony Hall with the same line, a redefining gig in Gloucester when he introduced The Sensational Space Shifters, a moving tribute to Bert Jansch in 2013, yet another Ceaseless Roar in Wolverhampton in 2014, performing Kashmir with Nigel Kennedy and Money with Paul Rodgers and Brian Johnson, yet another rebirth with a lunchtime date at Maida Vale studios on October 6. The odd night when it didn’t really spark, that stage that looked like a block of cheese in ’85, Tom getting lost on the way back from Oxford in ’83 (Slough on a dark December night did not look good!) Mr Foy’s car near conking out in the early hours on the way back from Warwick in 1988 when three fan belt purchased quickly in succession couldn’t fix it (Gary you should have realised I brought trouble and strife! ), and by his own admission some confusing moments as his career veered this way and that, well we valiantly followed suit. ‘’’It’s been real’’ as the singer once put it himself. Of course, along the way there’s been the camaraderie of like minded fans. Indeed a fair few of you out there will have shared some of those memories above as they unfolded. Many a friendship formed over the years, Many a pre gig and late night beer, many a curry, many a pre and post gig discussion of why this singer remains so inspirational in our lives. And that’s a trend I am sure will continue. I am also by no means alone in stacking up the Plant gigs and memories – it’s something that has become second nature amongst countless followers – Gary Foy and Krys Janzen are no far behind me in their Plant gig going tally (in fact long time TBL supporter Paul Harper has just added another 7 gigs to his tally on this current tour) – as witnessed by the feedback and reports received from the UK tour and featured on the TBL website in recent weeks. 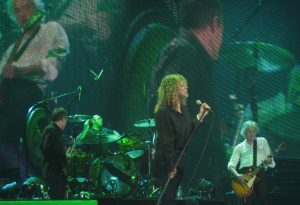 From the glory days of Led Zeppelin, through small club gigs with the Honeydrippers, his initial tentative solo tours, the mid 90s Unledded collaboration with Jimmy Page, back to the cubs with the Priory Of Brion, esoteric nights with Strange Sensation, the remarkable one off Zeppelin reunion at the 02, Grammy award winning bluegrass musings with Alsion Kruass to the eclecticism of The Band Of Joy and sheer inventiveness of The Sensational Space Shifters. Plus guest appearances with the likes of Nigel Kennedy and Paul Rodgers. A journey that has taken me from the vast fields of Knebworth to backstreet pubs in Birmingham. From New York to Istanbul, Paris to Dublin, Glasgow to Cornwall and beyond. From secret filming sessions, rare TV appearances, album launch gigs, the fabled 02 reunion, party nights in Kidderminster and homecoming gigs in Wolverhampton. 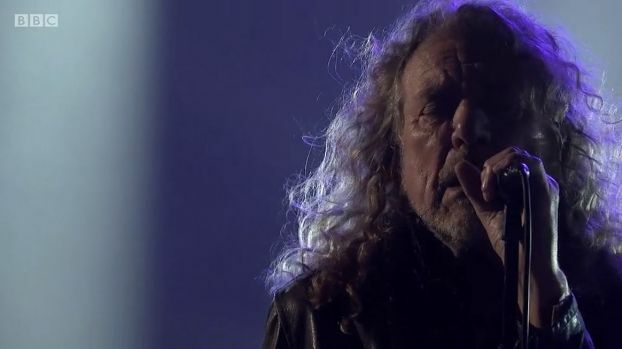 And as much as we look back, it’s still all about the next gig: The next musical high, the next Robert Plant vocal performance sung into that Shure SM58 microphone that will leave you breathless in admiration. 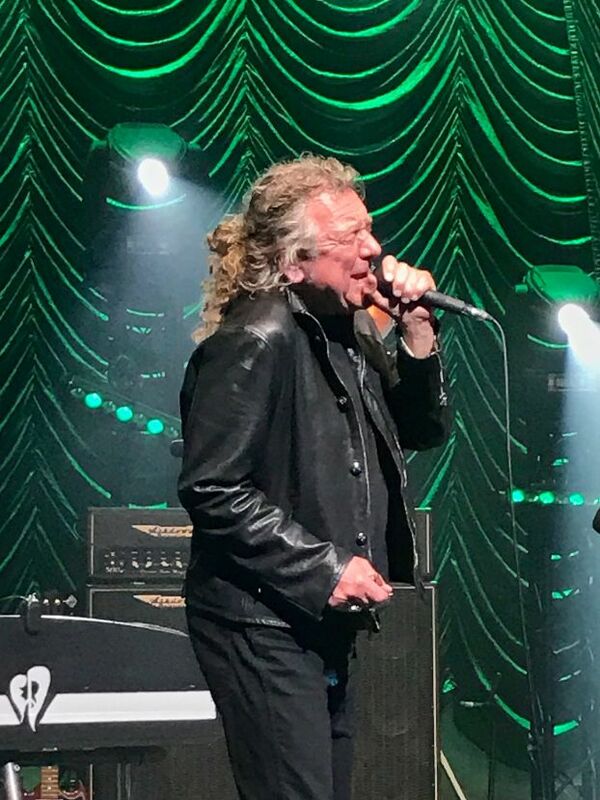 As mentioned above – tonight’s Robert Plant show will be the 58th occasion I have seen Robert Plant sing into that Shure microphone at a London gig through Zep and all the solo years and guest appearances – and the 120th occasion overall.